We've been a sick crew over at our house for the past week+. Amelia got her first cold and was nice enough to share it with both me and my husband. You really can't explain to a 7 month old not to cough in your face or wipe her little nose on your shirt, hands, neck, or anything else in her reach. Since it was a doozy of a cold, it seems like it has been forever since we've all been able to breathe comfortably. Luckily we're pulling out of it, and we're counting our lucky stars that it wasn't the flu that has been been hitting most of the country pretty hard right now. Hallelujah for flu shots and our boring lifestyle. I'm usually a cereal- or oatmeal-for-breakfast person, but for some reason when I have a cold I feel like making waffles or pancakes. I think in my mind, waffles and pancakes are for the lazy mornings when you sleep in and don't get out of your pajamas until noon. Since that is my favorite way to deal with being sick, making waffles is my way of pampering myself when I start to feel a cold coming on. These malted blueberry waffles were on the menu this week since I felt like trying something a little different from the norm. If you haven't experimented much with malt powder, let me encourage you to try it some time. Malted milk powder is usually sold by the ice cream toppings (at least in the stores around me) and adds great flavor to shakes, cookies and other foods. Rice Krispies has malt flavoring, if that helps you picture the flavor. In my mind, it is what takes these waffles from good to special. The blueberries that give explosions of flavor don't hurt, either. The waffles aren't overly sweet themselves, so you really can top them however you like. I used maple syrup on mine, but a fruit syrup or a sweetened whipped cream would have been wonderful, too. In a large bowl, combine the flour, sugar, salt, oil, milk, egg, malted milk powder, and baking powder and mix with a whisk until well combined. Do not over mix. It’s OK if the batter is slightly lumpy. Gently fold in the blueberries, using caution not to break them. Heat a waffle iron and liberally coat it with cooking spray. Ladle the batter onto waffle iron and cook until golden brown, about 8 minutes. To keep the waffles warm and crisp, keep them covered in a 250-degree oven and then just before serving uncover to expose waffles to the dry heat for a few minutes, then plate. ugh...so many ppl are sick right now...hope you feel better, but ya, that's all part of having small kids. When they start school, that is the worst. Instill good handwashing in your daughter early, and it be invaluable to her when she gets older. The waffles look and sound amazing. I love malted ANYTHING!! Glad your family is on the mend. What wonderful waffles. I love breakfast food for every meal! These look fantastic. Ooh, adding malted milk powder to waffles sounds interesting. 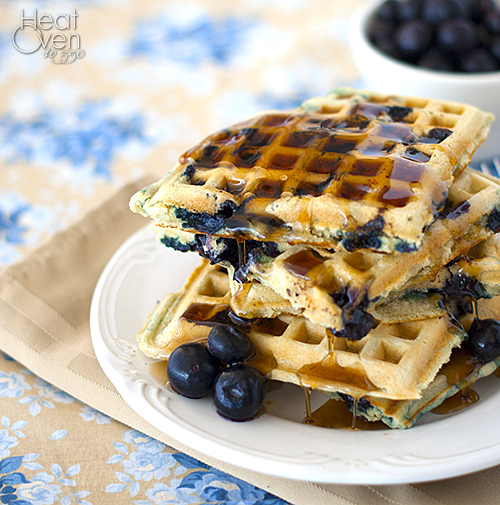 I wish I had some blueberries in my freezer so I could try these right now. I'm glad you guys are feeling better! These sound really great, and I just purchased some Ovaltine yesterday. I'll have to give this a try! 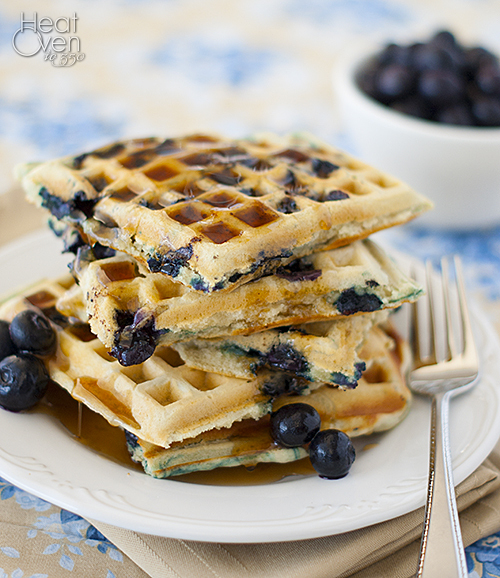 I haven't had waffles with blueberries in them and the malt is another great idea.